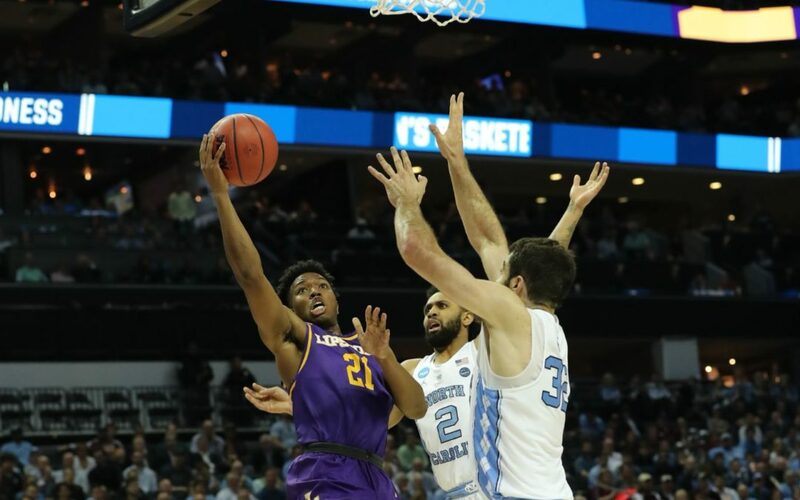 CHARLOTTE, N.C. — In the school’s very first NCAA Tournament appearance, Lipscomb hung around with the University of North Carolina Tar Heels, but eventually fell 84-66 to the reigning NCAA champions. Lipscomb led the 2017 champs as late as the under-four timeout in the first half. Junior Garrison Mathews struggled with UNC’s Theo Pinson, who said he wanted to “make everything tough” on the ASUN’s leading scorer. “We knew we couldn’t support that much on him,” Pinson said. “Once he gets going, he gets going.” Pinson held Mathews to eight points on three-for-14 shooting. But even though the Bisons didn’t get Mathews’ best night, they looked the part of Cinderella for most of the first half. Kenny Cooper scored the first basket in Lipscomb tournament history on a three from the right wing. Mathews got on the board with an and-one layup in transition. Then a trio of Tar Heel turnovers and threes from Michael Buckland and Eli Pepper gave Lipscomb a 12-9 lead at the under-16 timeout. Marberry missed a pair of layups that would’ve extended the lead further. Mathews and Marberry shot two-for-seven each in the half. But North Carolina kept scuffling and the Bisons held the lead until Heels star forward Luke Maye’s three made it 25-23 Tar Heels. When Williams dropped in a three on the next possession, the majority-Carolina crowd erupted, and UNC seemed poised to make a run to put the game out of reach. But Marberry scored in the post to get the purple-clad Lipscomb fan section back into the game, then Maye turned it over going into the under-eight minute stoppage. Lipscomb scored 10 points off of eight Tar Heel turnovers in the half. With Mathews off the floor at the end of the half, UNC galloped out to a 10-1 run and a 43-34 lead on Joel Berry’s layup with just over 30 seconds left. Pinson—a high school teammate of Lipscomb guard Michael Buckland—led the 2017 champs with 10 in the first. Cooper paced the Bisons with 11 points. Marberry carried the Bisons early in the second half, working Maye on the block for a pair of layups and drawing two fouls. But UNC gradually pulled away, making their first three triples of the half and then grinding away on the glass. The Heels out-rebounded Lipscomb 47-29. Alexander said “big-picture,” he felt that his team was “doing okay” despite inconsistency on a few details like ball screen defense and missed assignments. “I didn’t feel like there was anything that we need to change, specifically,” he said. Senior Aaron Korn’s fast break layup with 6:37 to play made it a 14-point game and jolted the Lipscomb crowd, who buzzed for a run to bring the game back within reach. Pinson committed an offensive foul on the other end, opening the door for the Bisons to string together a pair of baskets. But Cooper turned it over, Pinson willed in an and-one putback and the game was out of reach. Pinson finished with 15 points and a team-high 10 rebounds and seven assists. Williams led the Heels with 18 points. Cooper made three three-pointers and topped the Bisons with 14 points. Marberry scored 13 points and pulled down seven boards, tied with Eli Pepper for the lead. The entire starting lineup of Lipscomb’s first-ever NCAA Tournament team is returning to the team next year—four will be seniors, including Nathan Moran, who will return from injury after starting for three years and missing this entire season. All will have higher expectations. Marberry, one of those seniors, said the team enjoyed the historic season along the way.